Who’s ready for Father’s Day?! We ADORE this opportunity to show the dads in our lives just how much we love them, and our kiddos do too! 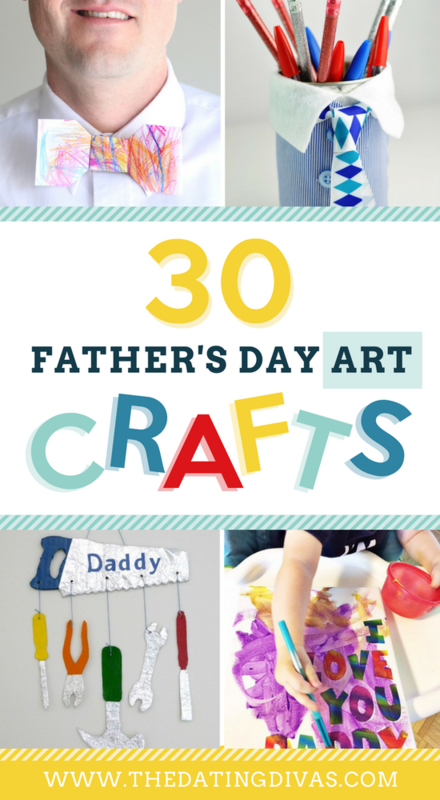 That’s why we’ve come up with a list of over 100 of the BEST Father’s Day crafts for kids. All of them are incredibly easy, super fun, and help make gift-giving an absolute snap. 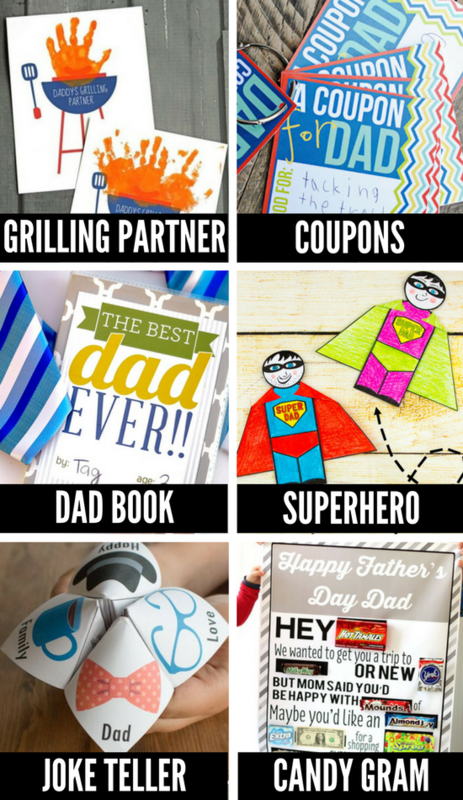 From printable Father’s Day crafts and art projects to homemade Father’s Day gifts and cards, this list has got it all. 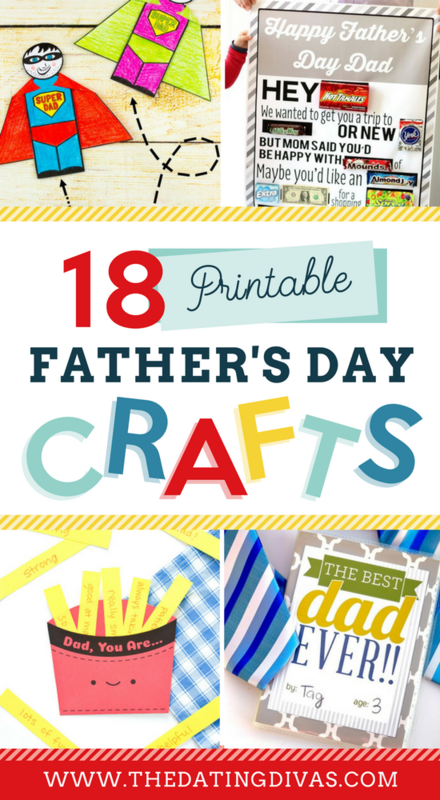 Ready to pick out the perfect craft idea for dad? Great! Additionally, you can give the above categories a click to jump right to that exact spot! Let’s be honest, that’s pretty cool. Alrighty, let’s dive right in and get going! 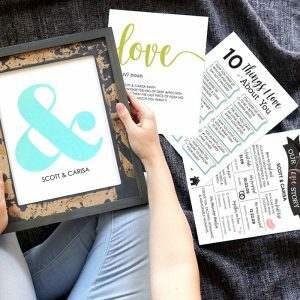 When you’re short on time but eager to craft THESE perfect printables are the solution for you and your kiddos. 1. Grilling Partner (Glued To My Crafts) – Show the grillmaster in your life he’s #1 and so totally great with this simple idea that’s perfect for kids. Also, it’ll make a fabulous addition to the front of the fridge. 2. Coupons (I Should Be Mopping The Floor) – Dad will know how much he’s loved now and long into the future with these easy, printable coupons that will make his day! Additionally, this idea acts as a great lesson in service! 3. 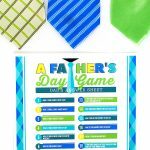 Dad Book (The Dating Divas) – Taking Father’s Day activities to a whole new level, this printable ‘Dad Book’ is PACKED with easy Father’s Day crafts and ideas the whole family will love. 4. 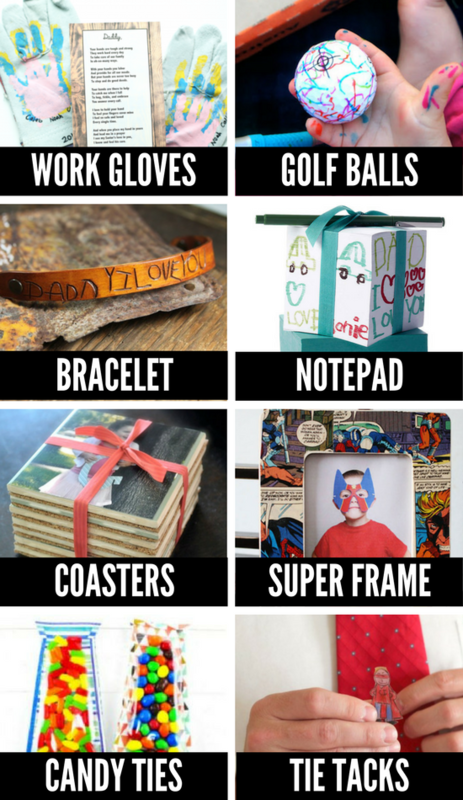 Superhero (Kids Craft Room) – Your idea of homemade Father’s Day gifts will soar to new heights and new places because this clever and crafty printable paper superhero is just that super. 5. Joke Teller (Bren Did) – Put a ‘dear old dad’ spin on a classic cootie catcher with this jokey idea. Also, it’s super duper easy which is terrific and a total win in our book. 6. Candy Gram (The Dating Divas) – Does dad have a sweet tooth and a love of all things sweet? 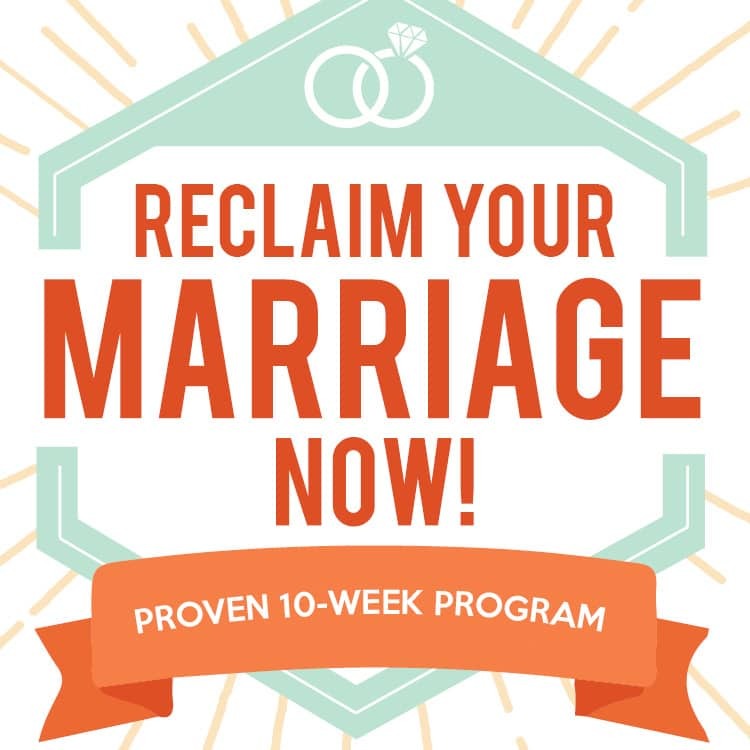 This is DEFINITELY an idea you’ll want to take a look at! 7. 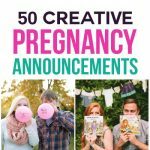 Fun Facts (The Girl Creative Blog) – Out of the mouths of babes and children come the FUNNIEST things! Present Dad with a smile and a laugh with this printable questionnaire that’s both quick and fun. 8. Candy Wrappers (The Dating Divas) – Gift him the gift of chocolate this year (or whichever candy bar he loves!) with these darling wrappers and a candy bar that’s easy enough for the kiddos to create. 9. Dad Glasses (Mr. Printables) – He’ll be rocking and rolling in no time at all because of these hilarious Dad glasses. And not to mention, the most stylin’ dad on the block. 10. Medallion (No Biggie) – Printable medallions add the perfect embellishments and touch of pizazz to any of your Father’s Day crafts and gifts! 11. 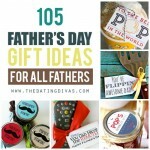 Coupon Book (Thirty Handmade Days) – Take the guesswork out of what to give Dad with this coupon book. It’s chock-full of ideas for how to serve him and is beyond easy to create. 12. Booklet (What Mom’s Love) – A printable version for both Dad and Grandpa makes this keepsake booklet one Father’s Day craft that will be cherished forever. 13. Shirt Cards (The Dating Divas) – Talk about ‘Oh my cute!’ We just can’t get over how darling these printable shirt cards are. 14. About Dad (Eighteen25) – Containing six printable pages (and a version for Grandpa), these easy-to-assemble booklets make homemade oh-so-doable. 15. Ties (The Crafting Chicks) – The perfect gift for younger children, these adorable print-and-wear ties make for quite the fashion statement. 16. Fry Box (Handmade Charlotte) – Comprised of a printable template and super simple assembly instructions, ‘fry’ wouldn’t Dad love this? 17. Placemat (The Dating Divas) – Turn Father’s Day dinner on its head with this activity placemat we’re obsessed with. 18. 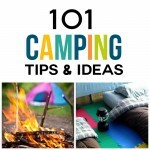 Dad Coupons (Better Homes & Gardens) – Watch as the littles put their own clever spin on these coupons for a Father’s Day gift and activity all rolled into one. From paints and pencils to everything in between, this list is the perfect way to get those littles in touch with their inner Picassos. 19. Award Ribbon (Easy Peasy & Fun) – Tell Dad he’s #1 with this artsy project. Also, it’s super quick and easy to make. Total win! 20. Daddy’s Shoes (Crafty Morning) – Bust out the paints for this super easy idea that’s perfect for your littlest littles. 21. Bowtie (It’s Always Autumn) – Grins are gonna happen with this cutie patootie bowtie. 22. 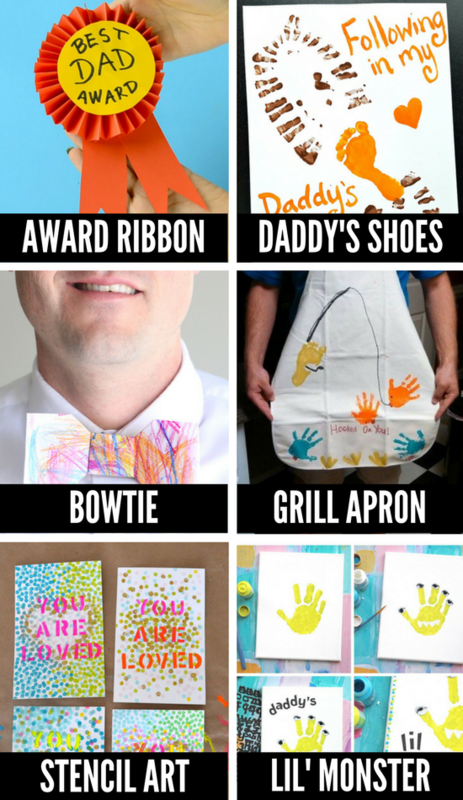 Grill Apron (Adventures of Frugal Mom) – Hold everything—Father’s Day crafts are about to be taken to a whole new level with this snazzy idea! Find a plain white apron, here. 23. Stencil Art (Small for Big) – If you’ve never heard of stencil art, you’re in for a treat! This incredibly creative idea requires nothing more than paint, pencils, paper and lots of love. 24. Lil’ Monster (Live Craft Love) – Grab the kids and get a little messy with this paintable project that’s too cute for words! 25. 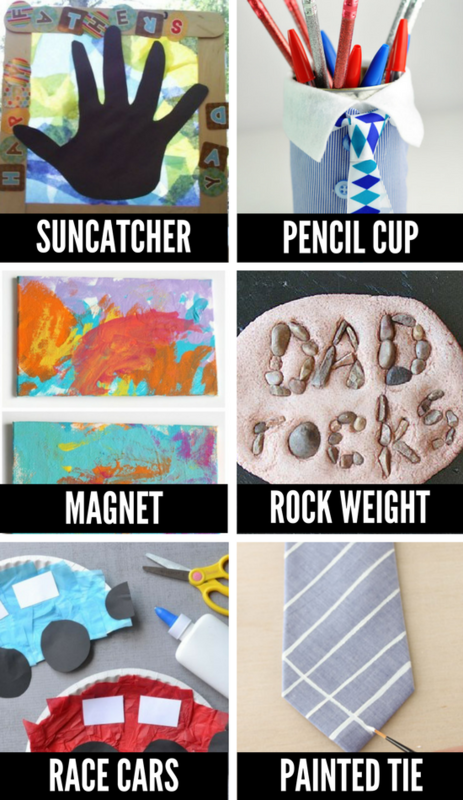 Dad Rocks (Non-Toy Gifts) – Talk about creative! We’re dying over this “My Dad Rocks” idea and you will too! 26. Gift Wrap (Happy Hooligans) – Add a little homemade magic to your Father’s Day gift wrap with this fun and fab idea. 27. Clay Bowl (Better Homes & Gardens) – The perfect place to keep bits and bobs, this handmade clay bowl feels super crafty without the overwhelm. 28. Gum Shirt (Organized 31) – Make sure Dad is minty fresh with this sweet idea! 29. Tape Crowns – (Hostess With The Mostess) – He’s king of the day so let him know with these terrific tape crowns. 30. Hero Stones (Crafts by Amanda) – If a little inspiration is on your wish-list, this is the craft for you. 31. Paperweights (Better Homes & Gardens) – You’re going to want to add this to your list of Father’s Day activities ASAP! They’re too cute for words. 32. Portrait (Small Hands Big Art) – Do you decoupage? You’ll certainly want to after seeing these perfectly paper-filled creations. 33. Handprint (Mommy Moment) – Preserve a moment in time with this precious handprint idea that Dad will love. 34. Sharpie Art (Happy Hooligans) – Obsessed with Sharpie markers as much as we are? You’ll definitely want to give this idea a peek! 35. Trophy (Happiness is Homemade) – The ‘winner’ of all homemade Father’s Day crafts, this trophy project will make him feel like he’s top dog. 36. Necktie Ring (Positively Splendid) – ‘Ring’ in Father’s Day the right way with this miniature tie idea. 37. Suncatcher (Real Life at Home) – Talk about Father’s Day crafts to help brighten the day. Cheery suncatchers are just perfect! 38. Pencil Cup (Chica Circle) – Even the least crafty of folks ‘can’ pull this one off (aren’t we punny?!). But seriously, isn’t this just too fun and fab?! 39. Magnet (Happy Hooligans) – Make the kiddos show Dad they’ll always stick by him with these hand-painted fridge magnets that are beyond adorable. 40. 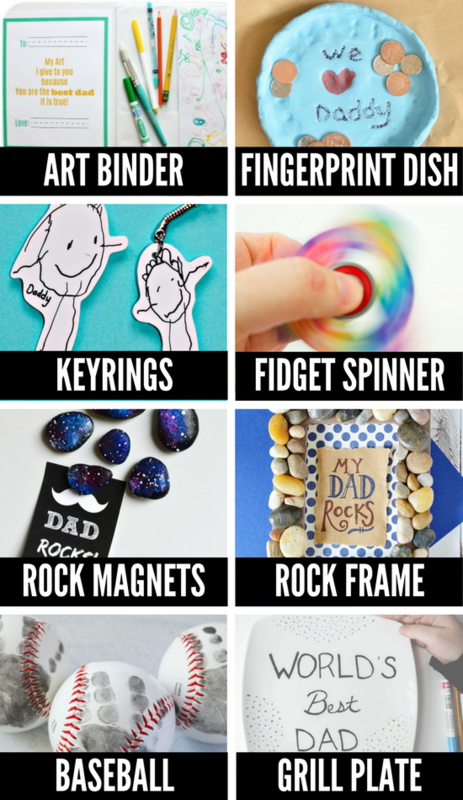 Rock Weight (Crafts by Amanda) – Allow the kids rock out and rock on with these super snazzy rock weights that will help Dad keep everything in order. 41. Race Cars (Glued To My Crafts) – Vroom vroom! Next stop—one happy dad. 42. 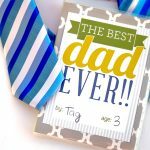 Painted Tie (Momtastic) – Buying Dad a tie at the store is sooo last season. Try painting one for him instead! 43. Tape Painting (Thriving Life) – Who needs paint when you’ve got tape?! 44. 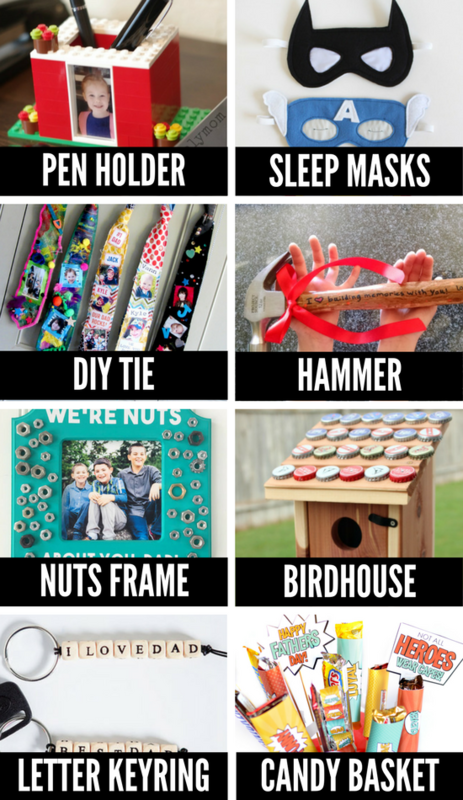 Tool Craft (Craftulate) – One of the sweetest homemade Father’s Day gifts for the handyman Dad, this idea is a definite winner. You’re definitely going to want to take a a look! 45. 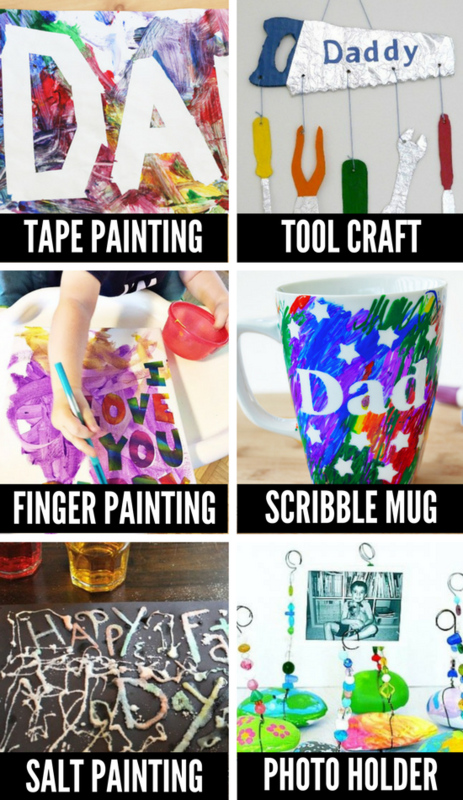 Finger Painting (Whiskey Tango Foxtrot) – Have the littles get down and dirty and create something special for Father’s Day in the process. 46. Scribble Mug (I Heart Arts n Crafts) – Coffee and cocoa loving fathers will adore this snazzy scribble mug and we do too! 47. Salt Painting (Parenting Chaos) – A science project and Father’s Day craft in one, we can’t get enough of this super cool salt painting. 48. 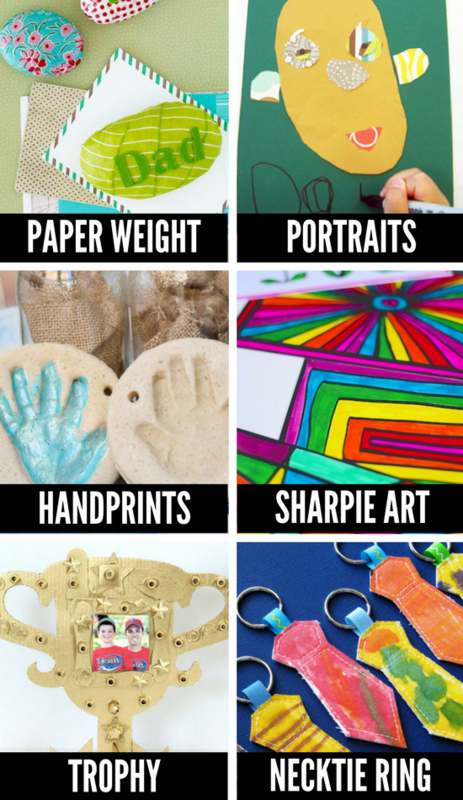 Photo Holder (Buggy and Buddy) – Get ready to take homemade Father’s Day crafts to an entirely new level with this snazzy photo holder, just pop in a favorite pic of Dad and the kids! 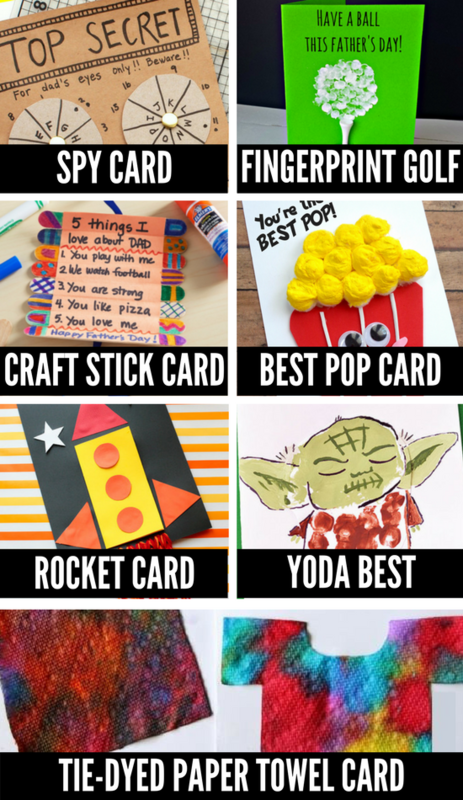 Help your children show Dad just how much they love him with these easy to make card crafts that are too cute for words! 49. 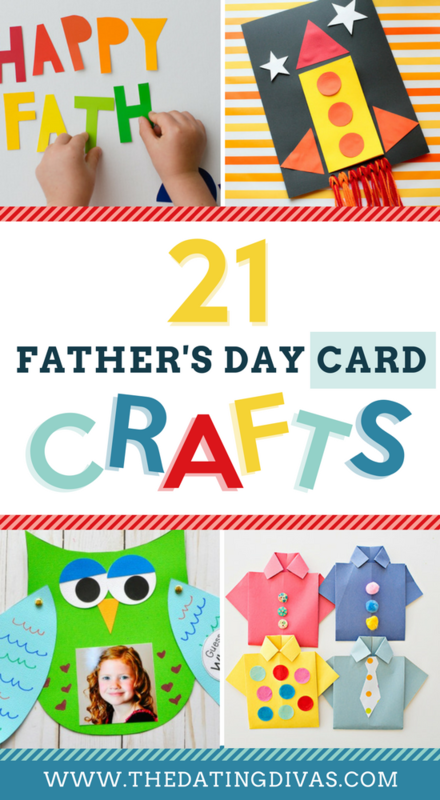 Owl Card (I Heart Crafty Things) – Move over sub-standard Father’s Day cards—there’s a new kid in town. 50. This Much Card (A Day In My Life) – This fantastic, foldable card idea will show Daddy exactly how much he’s loved. 51. Swedish Fish (Crafty Morning) – “Fish” Dad an extra special Father’s Day with this sweet card project. 52. M&M’S Card (Aly Dosdall) – We think M&M’s stand for Mmmm…good and dad will too! 53. Monsters Card (I Heart Arts n Crafts) – Crack out the paints and get ready for some hand/footprint fun! You’re going to want to check this one out. 54. 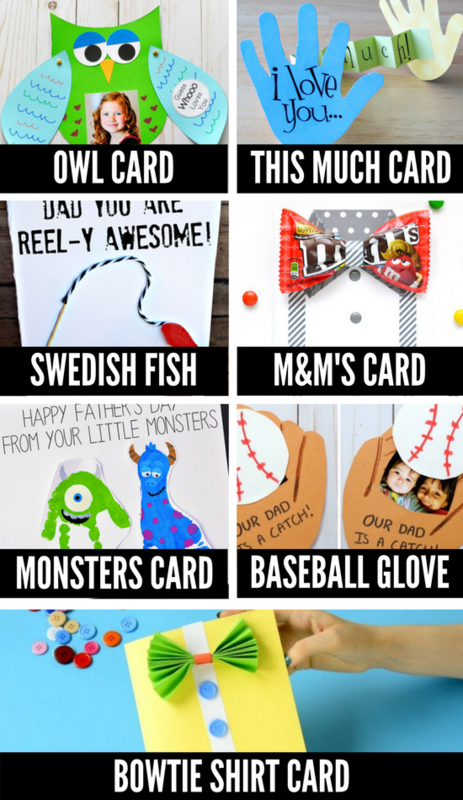 Baseball Glove (The Soccer Mom Blog) – The perfect way to show Dad what a ‘catch’ he is, this sweet mitt-style card is a fabulous option for sports-loving fathers. 55. 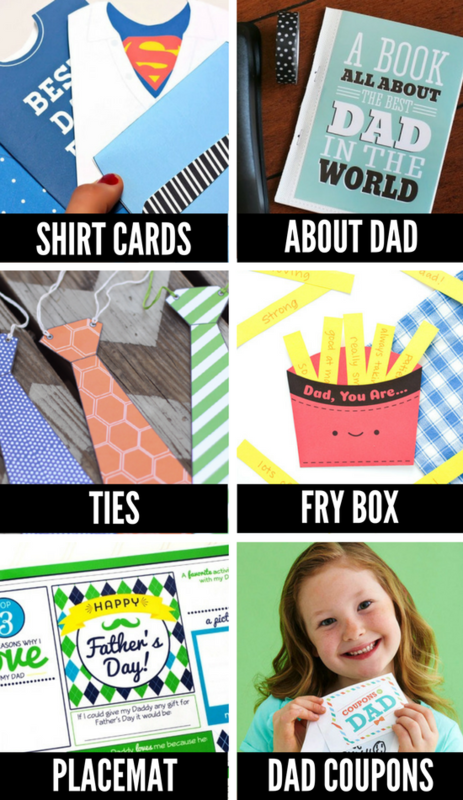 Bowtie Shirt Card (Easy Peasy and Fun) – Creative and colorful, this is a MUST for your list of Father’s Day card ideas. 56. 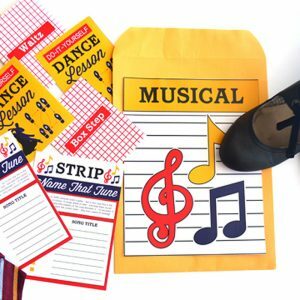 Spy Card (Pink Stripey Socks) – Young spies will love whipping up this super sleuth-y card this Father’s Day. 57. Fingerprint Golf (Crafty Morning) – Golfing dads and grandpas will be all sorts of gaga over this fun fingerprinted card. 58. Craft Stick Card (Michael’s) – Easy peasy and full of flair, this foldable craft stick card is way too cute! 59. Best Pop Card (I Heart Arts n Crafts) – If you love being punny (we sure do!) this is the card for you. 60. 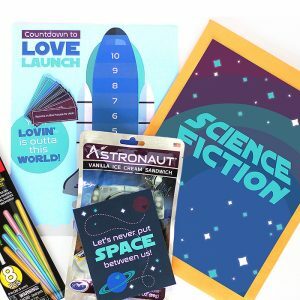 Rocket Card (Non-Toy Gifts) – For those who love their dads to the moon and back (that’s us! ), this is the perfect space-worthy card craft. 61. Yoda Best (Crafting by Holiday) – Any Star Wars lovers out there? The force is strong with this card idea. 62. Tie-Dyed Paper Towel Card (Happy Hooligans) – Get your tie-dye on (with minimal mess!) with these fantastically fun paper towel tie-dyed shirt cards for Dad. 64. Alien Card (I Heart Crafty Things) – Extra-Terrestrial men have got NOTHING on the man in your family’s life. 65. The Coolest (Homeschool Preschool) – Some popsicle themed fun will show Dad he’s the absolute coolest. 66. Race Car (I Heart Arts n Crafts) – Does Daddy make your heart race? Behold, the card for you! 67. TP Roll Card (Pink Stripey Socks) – Put those empty toilet paper rolls to good use with this adorable idea we totally want to try. But for realz, who knew empty toilet paper rolls were so magical and useful?! 69. Origami Shirt Card (Hello, Wonderful) – If your kids are origami lovers, you HAVE to add this to your Father’s Day crafts arsenal. 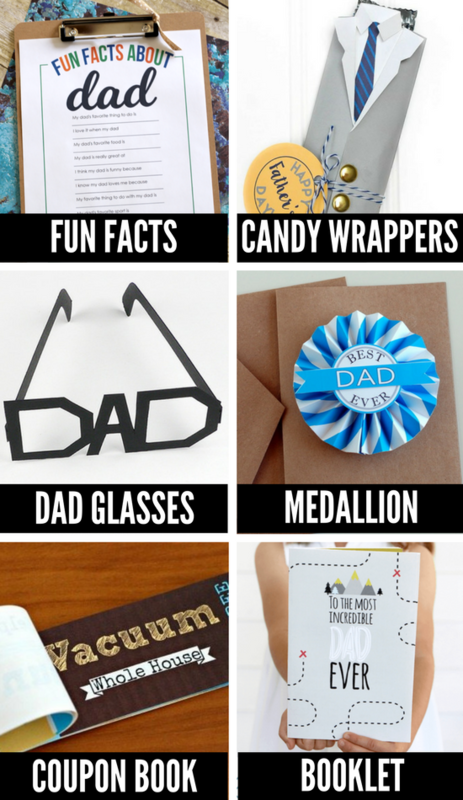 Homemade Father’s Day Gifts are where it’s at and this list has so many great ones to choose from! 70. Lego Memories (The Seasoned Mom) – Stash those memories in style with this darling Lego idea! But seriously, how clever! 71. 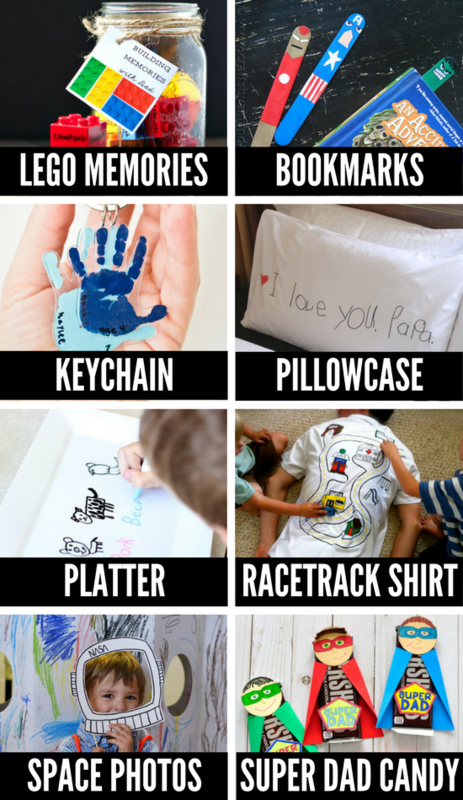 Bookmarks (Crafts By Amanda) – Book-loving fathers everywhere will be obsessed with these easy to make craft stick bookmarks. 72. Keychain (Grey House Harbor) – We can’t get enough of this sweet keychain idea for fathers! Also, it’s super quick to make and is just perfect for little and big hands alike! 73. Pillowcase (Mama. Papa. Bubba) – Dad will sleep super well because of this oh-so-precious and personalized pillowcase craft. 74. Platter (Gluesticks) – Looking for homemade Father’s Day gifts for the chef in your life? You’ve found it! 75. Racetrack Shirt (The Blue Basket) – How about we all take a minute to appreciate the genius behind this clever racetrack shirt idea. 76. Space Photos (Bloesem Kids) – Help your kids unleash their inner space explorer/photographer with this homemade gift idea just for Dad. 77. 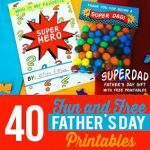 Super Dad Candy (I Heart Crafty Things) – Up, up and away he goes with these darling candy-filled superheroes that are the perfect Father’s Day treat! 78. Art Binder (Mom Collaborative) – Gift a place for Dad to store all those art projects and memorabilia with this customizable art binder. But really, how perfect is this? 79. Fingerprint Dish (What Katy Said) – Tiny ones will love getting their fingers and their creativity into this clever clay dish. Also, it’ll keep them occupied for quite some time…we promise! 80. Keyrings (Messy Little Monster) – An old favorite (shrinky dinks!) 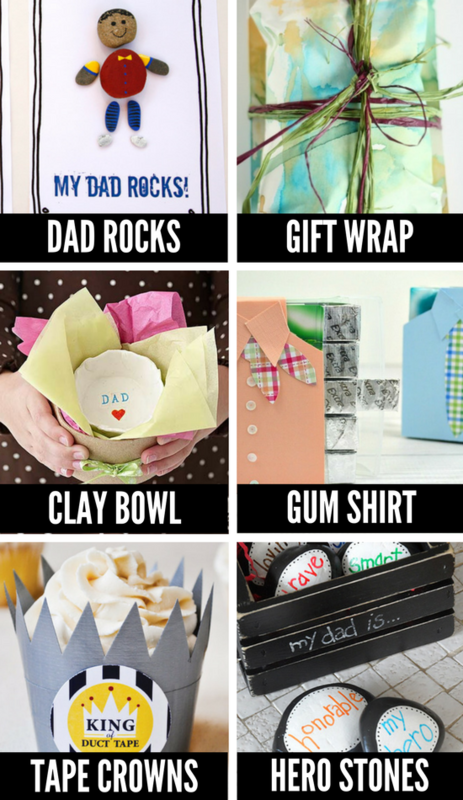 and super easy craft idea take center stage because of this perfect homemade Father’s Day gift. 81. Fidget Spinner (The Maven) – They’re all the rage and now Dad can have one too! Also, did we mention we’re obsessed? 82. Rock Magnets (Adventure In a Box) – Ordinary rocks will be transformed because of this one-of-a-kind gift and fridge addition that totally rocks. 83. Rock Frame (Mommy Moment) – Rock out and rock with this special rock frame, just for Dad! 84. Baseball (The Kindergarten Connection) – Swing batta, batta! The baseball-loving father will adore these handprint baseballs—super easy and super fun! 85. Grill Plate (Mashable) – Present that grillmaster with something truly special with this personalized grill plate. In addition, you could throw in a snazzy new apron and voila! Perfection. 86. Work Gloves (I Can Teach My Child) – Perfectly painted gloves and a special poem make this gift super special! Therefore, gardening is about to become a whole lot easier and way more fun. 87. Golf Balls (Laughing Kids Learn) – Fore! Hand-colored golf balls are comin’ in for landing and for Father’s Day! 88. Bracelet (Lil Blue Boo) – Hand-engraved and totally chic, Dad will be stylin’ with this homemade gift idea. But seriously, how fun! 89. Notepad (Martha Stewart) – Help give that scratch paper a special makeover with this darling notepad and pen set- made just for Dad! 90. Coasters (Mod Podge Rocks!) 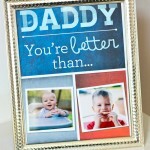 – Personalized photos and a special homemade touch make this is a definite winner on our list of Father’s Day crafts. Additionally, the whole family can enjoy them! 91. Super Frame (Crafts by Amanda) – There’s nothing ‘comic’-al about it… this gift is amazing and super creative! Also, we’re totally planning on making one! 92. Candy Tie (Natural Beach Living) – Say goodbye to ordinary ties and give Dad one that will really satisfy his sweet tooth and his style. 93. Tie Tacks (A Girl & A Glue Gun) – Shrinky dinks make another special appearance and are ready to be showcased with these cuter than cute tie tacks! Also, how adorable. 94. Pen Holder (Lalymom) – Legos are about to get a fancy new makeover and facelift with this snazzy photo-filled pen holder. 95. Sleep Mask (Cutesy Crafts) – Daddy will sure get some much-needed shuteye and relaxation with these oh-so-amazing superhero-themed sleep masks. As a result, everyone’s happier. 96. DIY Tie (Sandy Toes & Popsicles) – We’re all sorts of gaga over these hand-embellished ties that totally take center stage. 97. Hammer (A Parenting Production) – Who asked for easy Father’s Day crafts?! All you need is a hammer and a permanent marker to create the perfect gift for Handy-Dad! 98. Nuts Frame (Happiness is Homemade) – It may be a little nutty… but we’re obsessed with this photo frame. 99. Birdhouse (Happy Hooligans) – Bring a little flora and fauna into Dad’s life with this handmade birdhouse that older kids will love to build. 100. Letter Keyring (Hello Bee) – Assist the kids in spelling out something special and sweet with these beaded keychains that Dad will adore! 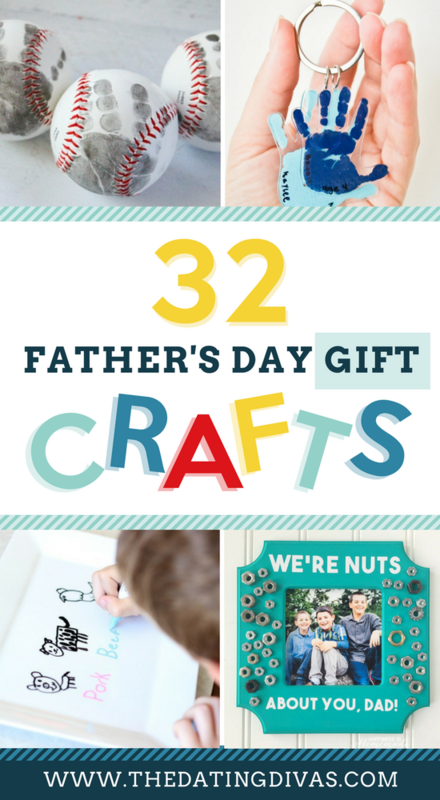 Was that a winning list of Father’s Day crafts and goodies or what?! For even more Father’s Day fun, be sure and take a look at our Father’s Day Gift Guide and our Father’s Day Breakfast Kit! Oh my goodness!! 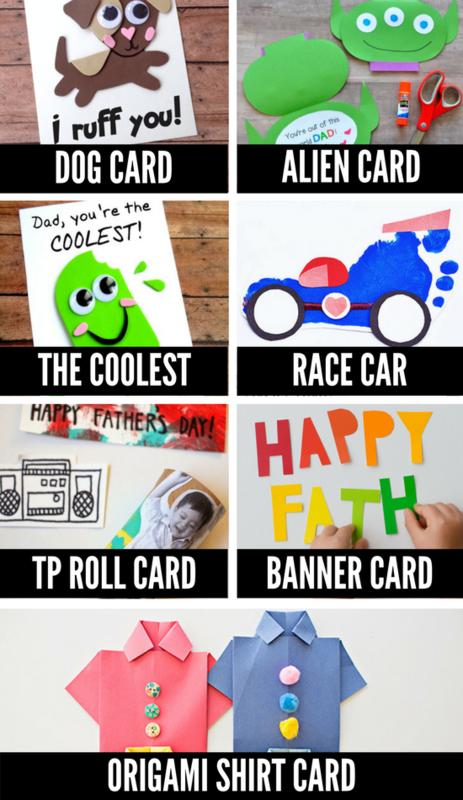 This is seriously the BEST list of Father’s Day Crafts EVER!!! I’m gonna let me kids pick out what they wanna mak!! SO cute! 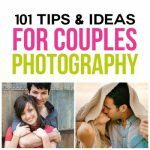 SOOOOO many cute ideas!!! I can’t wait until my lil man is old enough to do these! So great! I will be consulting this over the years! I love the painted tie one! Holy Crafting Scissors Batman, this list is AWESOME!! I was needing some ideas for a good card for Father’s Day. These are so perfect!